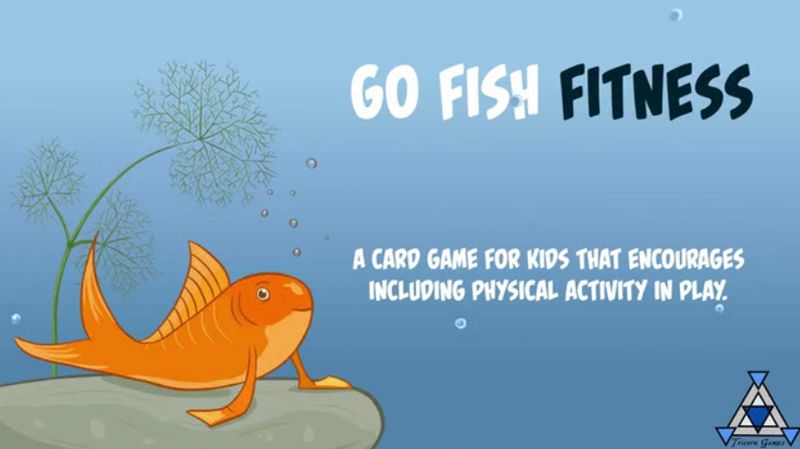 I'm very happy to post a new Ask A Developer: 100 Words or Less with Garret Rempel about his new project: Go Fish Fitness. Describe your game in one paragraph. Go Fish Fitness is a card game for kids based around the classic rules of "Go Fish" with an added fitness component to encourage them to get up, jump around, and incorporate physical exercise in a fun and competitive way. 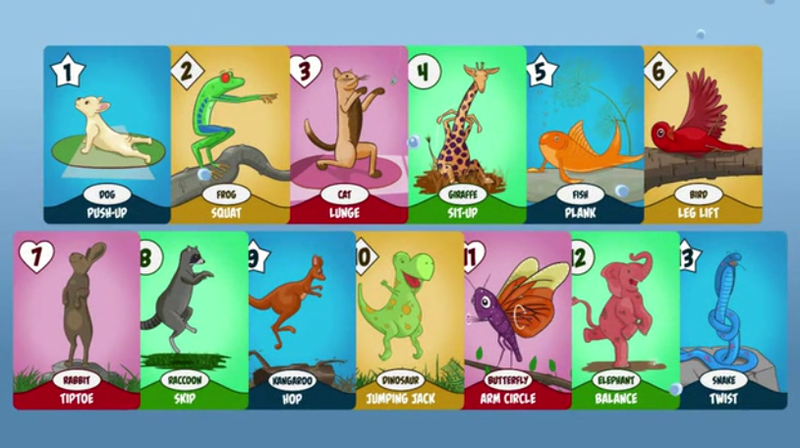 Players compete to make a match and force everyone else to perform the activity shown on the cards. What were your objectives (three) with the original design? · make it useful for other games, based on a 52 card deck with 4 suits, the game can be used for any game requiring a standard deck of cards. The artwork is absolutely beautiful and appeals perfectly to kids. It is cute, colourful, and humorous in a way that captures the fun and movement that we are trying to encourage. Fredrik Skarstedt did the artwork on the game for us, and he did an incredible job. 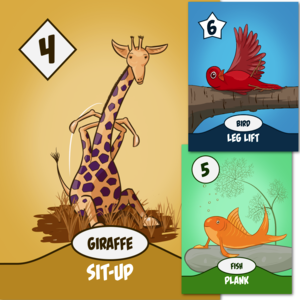 Just a little longer than a regular game of Go Fish (to allow for exercising) a round can be completed easily in under 10 minutes. What is your design process? What would you consider the foundation of your process? We started with an idea, a solid concept and objectives that we wanted to achieve, and then the process involved experimenting, revising, tweaking, with that objective in mind. We made sure to solicit ideas, opinions, and impressions from as many people as possible – and gave Fredrik a solid concept to work with, but a free hand to put his aesthetic stamp on it. How do you handle design paralysis? What do you do to move forward? If something isn’t working for you, try something new – try something radical and then compare it against what you have. Its easier to identify things that work, and things that don’t, and pick the best pieces when you have options. How has the game changed during playtesting? How long did the playtest last? The game was built on a solid foundation and concept which didn’t change during the course of development. What changed was the artwork, revising, trying different options, and discovering what worked best and appealed as widely as possible. The playtesting/development period lasted roughly 3 months of back and forth until we got it right. How did you handle the process of getting your game to market? We are managing the process ourselves, as developer and publisher, but working with amazing partners. Fredrick on the art & creative feedback, Print & Play Games for production (a division of AdMagic – producers of Cards Against Humanity and Exploding Kittens), and FlagShip and Canada Post for distribution. How do you handle marketing? How much time have you devoted to marketing versus design/development time (in hours, if you know)? Marketing has involved putting together the Kickstarter campaign and contacting dozens of websites, blogs, and also directly talking to hundreds of friends and acquaintances and encouraging them to help us spread the word about the game. Many hours were spent putting it all together, refining it, and communicating. But overall, marketing was less than a quarter of the time spent on making the product as good as we possibly could make it in addition to arranging production, shipping, and all the other bits and pieces to turn the idea into reality. What is the release date of your game and the price? Where can people buy it? We are only aiming to cover production costs and have tried to strike a balance between having a low funding level to be successful, and keeping the per-copy cost down. All contribution levels are in Canadian Dollars – the lowest tier (one physical game copy) is $15 CAD (~$11.25 USD) but if you are quick we have an Early Bird special that we are subsidizing out-of-pocket for $12 CAD (~$9 USD). We have 4 projects currently in development, one which we are planning to announce publicly in early-April after the Kickstarter has ended. Keep at eye on Tricorn Games or follow us on Twitter @TricornGames, Instagram @tricorngames, or on Facebook at facebook.com/TricornGames to stay up to date. We also have a $1 reward tier that includes a printable PDF of all the cards, but also gives you early access to updates and announcements of future projects before anyone else hears about them!